Low calorie, zero fat and deliciously healthy spaghetti squash is on my perfect vegetable list! If youve never had spaghetti squash, youre missing out on a real treat! Its a yummo squash that acts like spaghetti (you know, the pasta kind), but its super good for you and very low calorie only about 42 calories per cooked cup! Yowza thats squash-tastic! 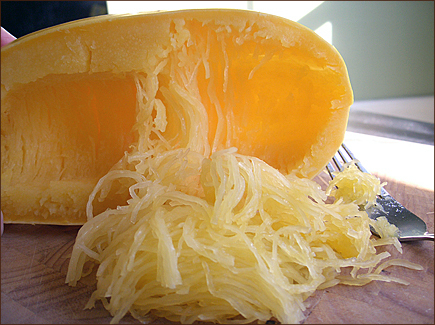 Spaghetti squash is available year round, but its finest hours are fall through winter. As I write this in the middle of September, Im already beginning to think about what Ill be serving for Thanksgiving Im not too obsessed with food am I LOL! This Spaghetti Squash casserole makes a great side dish to a festive holiday meal, but I also enjoy eating it as a meal unto itself. I often cook mine in single serving individual casserole dishes and serve with a hearty homemade french bread (or store bought, if you prefer), and a salad. A great vegetarian meal with all the comfort of a casserole. This doesnt freeze well, but it never lasts that long at my house anyway. I hope youll give it a try and let me know what you think of it. Cut squash in half lengthwise; remove seeds. Place squash cut sides up in a microwave dish with 1/4 cup water. Cover with plastic wrap and cook on high for 10 to 12 minutes or until tender. Add more cooking time if necessary. Let stand covered, for 5 minutes. With fork comb out the strands to yield 5 cups; set aside. Lightly coat a nonstick skillet with cooking spray; place over medium heat until hot. Add onion; saute 3 minutes or until tender. Combine squash, onion, and next 6 ingredients in a large bowl; stir well. Spoon into a 10x6x2 inch baking dish coated with cooking spray; set aside. Combine melba toast crumbs and next 3 ingredients, and stir well. Sprinkle over squash mixture. Bake at 350° for 40 minutes or until thoroughly heated. Whats your favorite way to serve spaghetti squash? 7 Comments on "LOW FAT SPAGHETTI SQUASH CASSEROLE"
I like spaghetti squash but dont often think to buy it. I made a dish with it a while back, which my family all liked. The only thing I wasnt crazy about was getting it out of the shell. It didnt come out all that easy, but it did taste good! .-= Eating Raw Foods Infos last blog ..Get Protein While Eating Raw Food =-. Did you cut it in half before you cooked it? If so, maybe you just needed to cook it a bit more. Mine always comes out quite easily by gently scraping a fork against it. When its completely cooked the squash will be a very pale yellow. Ive noticed that if its a bit on the orangie-yellow side it still needs to cook a bit more. This is one of my favorite vegetables. Just curious do you eat cooked vegetables or are you eating 100% raw? I cant vouch for eating this raw LOL! I made this last night and its just delicious. Very easy to put together and even my hubby liked it. .-= Bobbi @Thyme &amp; Travels last blog ..Bandelier National Monument, New Mexico =-. I stumbled upon your site while looking for a new way to cook spaghetti squash. I tried this recipe last night and wanted to share that it was delicious! Paired it with a small salad and loved it! Thanks, Ill definitely be trying some of your other recipes! Wow, I have never actually heard of spaghetti squash. That looks great, I cant wait to try it. I cant wait to hear what you think of it! Its a favorite around here and Im confident youll love it! So versatile too!